1- When to use UniversRadio EmergencyRadio ? 2- How to use it ? This is an application can be launched after you are ejected, and for Search And Rescue mission. Be carefule with relief and range of transmission. 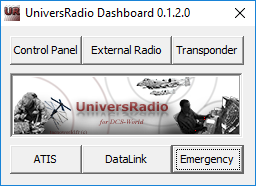 Once you are ejected, launch UniversRadio EmergencyRadio from UniversRadio DashBoard shortcut and choice “Emergency”. 2- How to use UniversRadio EmergencyRadio ? ‘UR Emerg’ can be hidden with the same ‘Hide window” input as UR ER. Like URER, middle click on window stops focus on DCS, and shows the Windows taskbar.